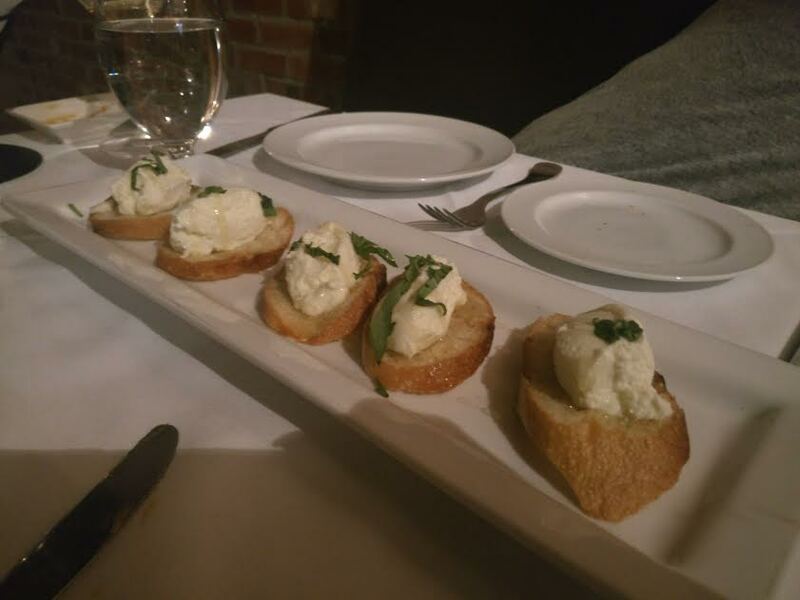 Last year, I went to Trattoria for my birthday and it was a good experience (see first visit here). Fast forward eight months later, Sangria suggested that we come here for their Tuesday special! I’m glad that she made a reso because it is very busy on Trattoria Tuesdays, where all of their pastas are on sale for $13.00. We came early around 5:30, and there was already a line forming. If you’re coming on a Tuesday, making a reservation is a really good idea or you’ll have to wait. 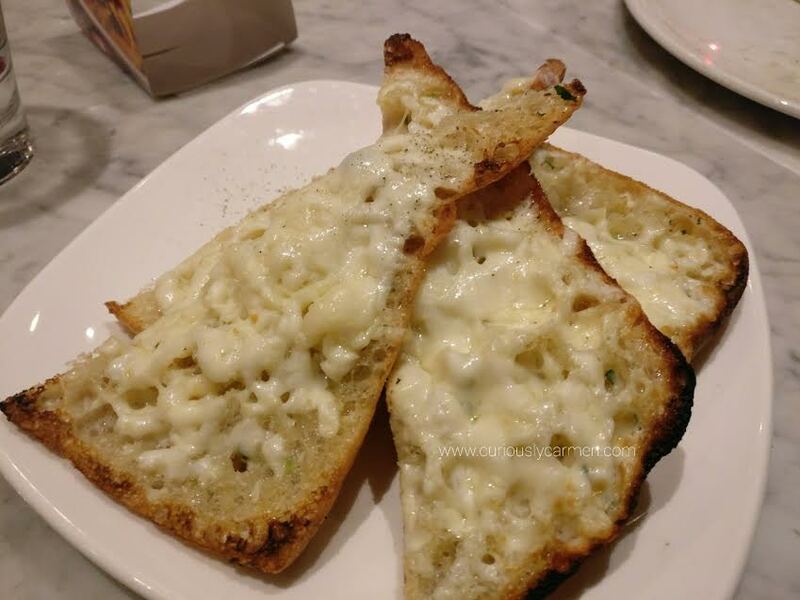 Cheesy bread $7.50 ($5.00 happy hour): I remember that this was delicious during my first visit, so we ordered this as a starter to share. It did not disappoint as well. 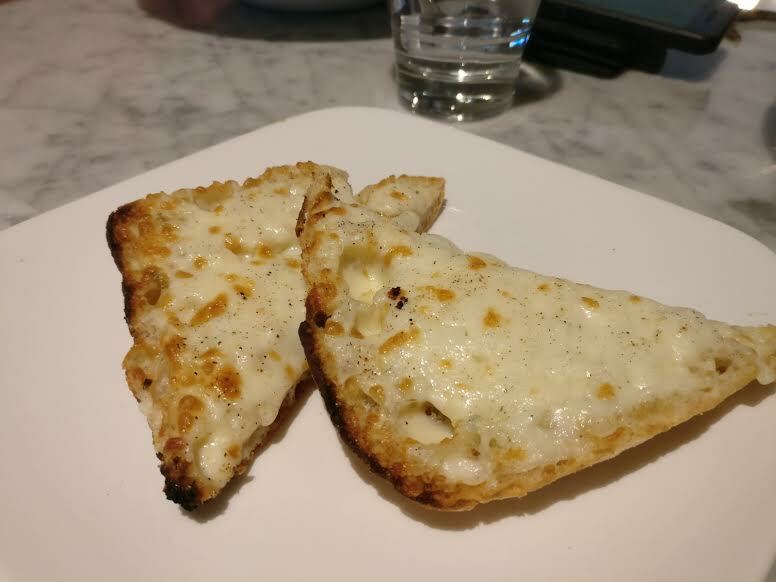 It was incredibly cheesy and garlicky, and served warm. 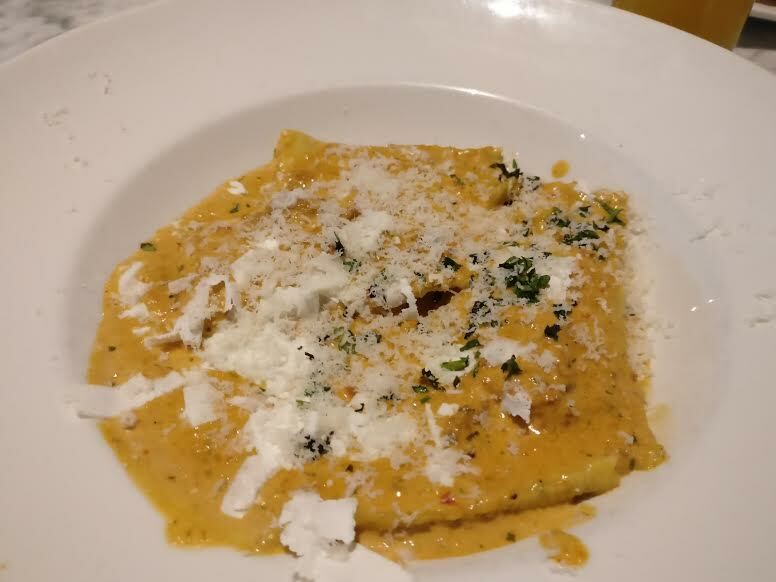 Crab & Lobster ravioli $24.95 ($13.00 on Trattoria Tuesdays): I was disappointed that they don’t have the smoked salmon & dill pasta anymore, that was so good! Since that was the original plan, I chose the crab and lobster ravioli instead. It was served in a creamy and cheesy pesto sauce. 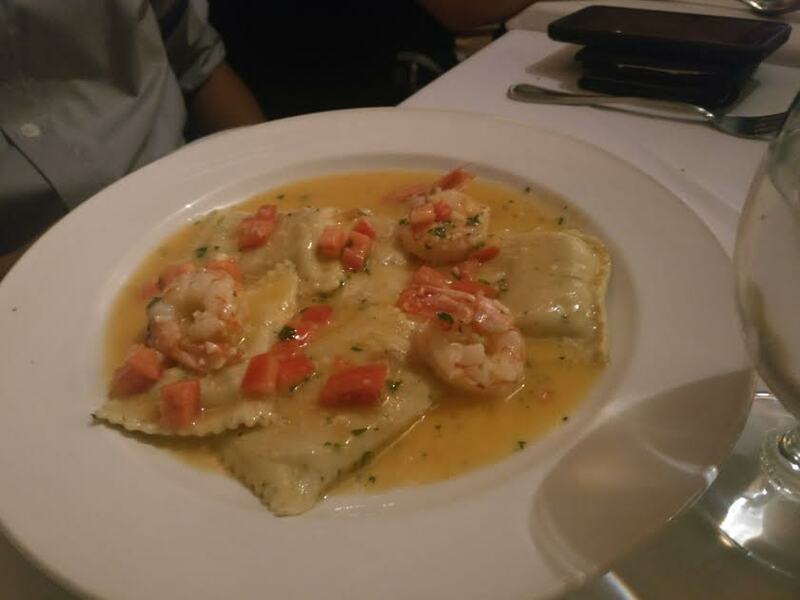 The ravioli was not stuffed and a bit flat, but the crab and lobster was delicious nonetheless. I liked how cheesy it was and there was a good amount of herbs in there to keep the dish exciting. 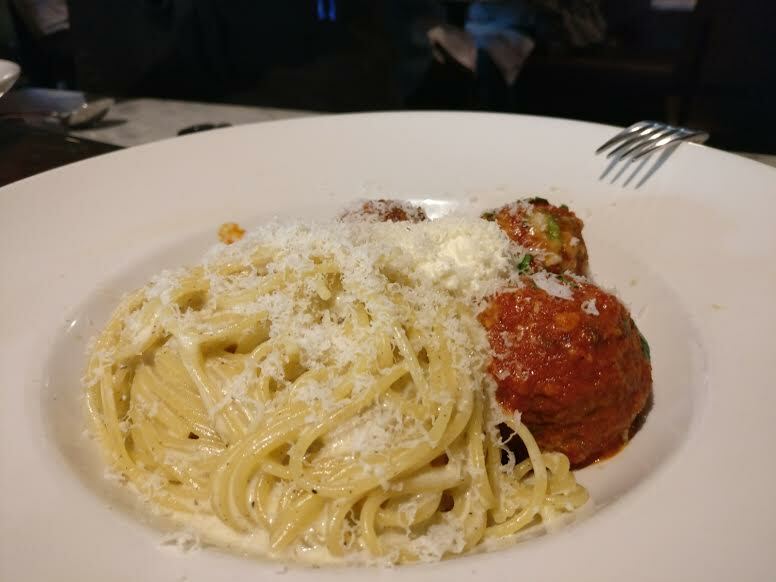 Truffled spaghetti and signature meatballs, $24.95 ($13.00 on Trattoria Tuesdays): The guys both decided on ordering this dish. I had a bite of the spaghetti and it did was so good! It came with a truffle cream which made the spaghetti very aromatic. Sometimes the food only has the truffle smell, and not the case which is disappointing. But I’m happy to say this was not the taste, you could definitely taste the truffle oil in it. I didn’t try the signature meatballs, but both of them did not have any complaints about their dish. 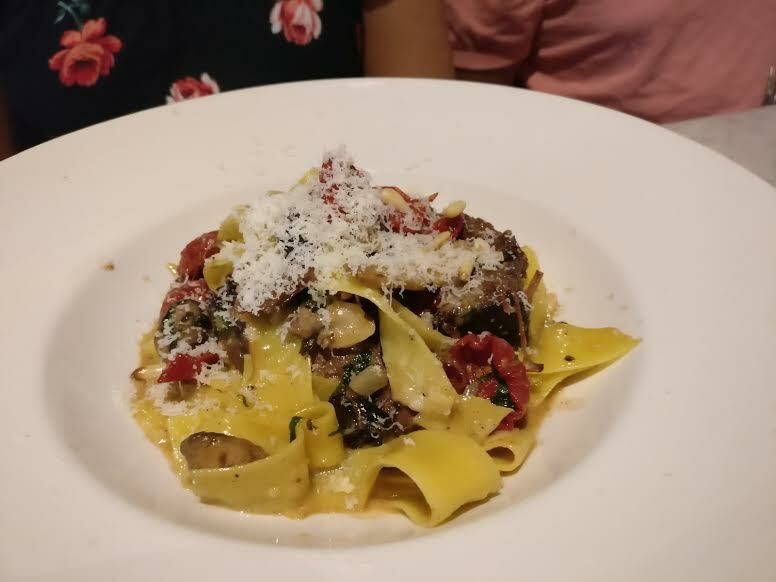 Short rib pappardelle $20.95 ($13.00 on Trattoria Tuesdays): Sangria has ordered this dish before and enjoyed it, so she got it again. This came with braised short rib, pine nuts, and wild mushrooms. She offered me a bite but I was quite full from my own creamy and rich ravioli so I declined. She had no complaints about it. 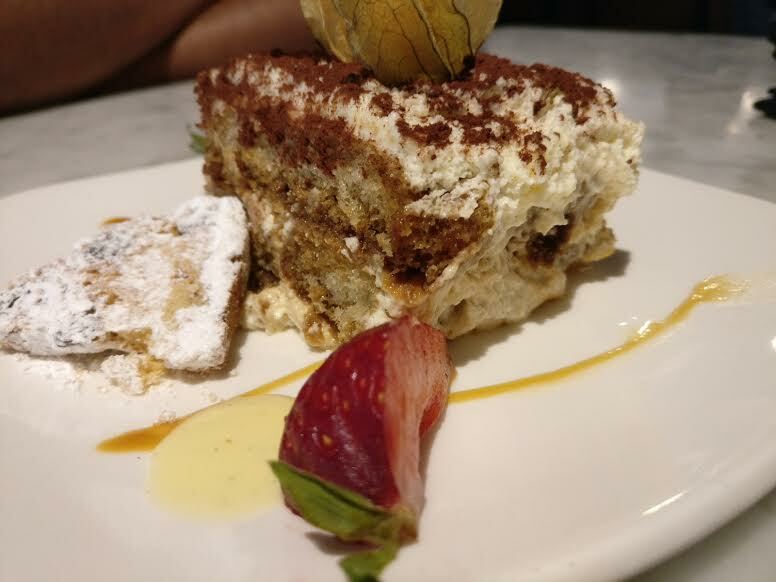 Tiramisu $8.95: Sangria and Lager split this the tiramisu cake for dessert! They enjoyed it a lot. 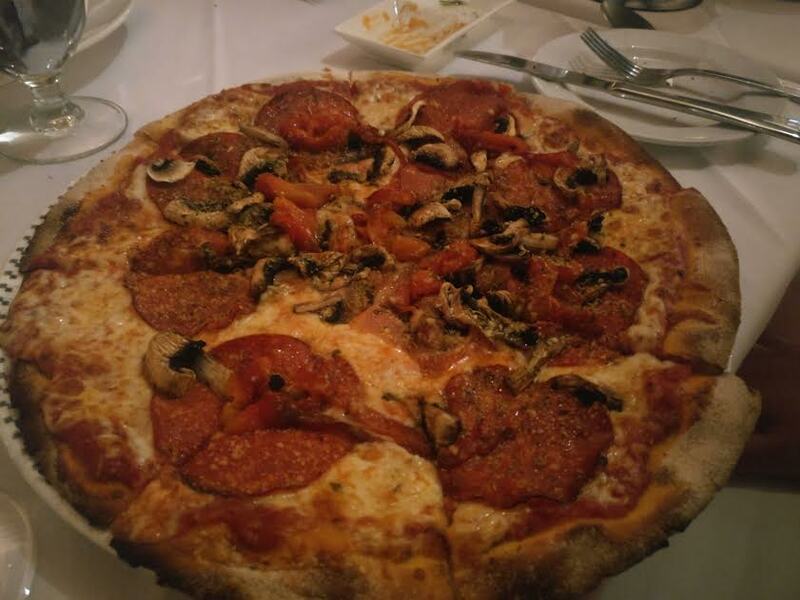 All in all, Trattoria Tuesdays is a very great value. 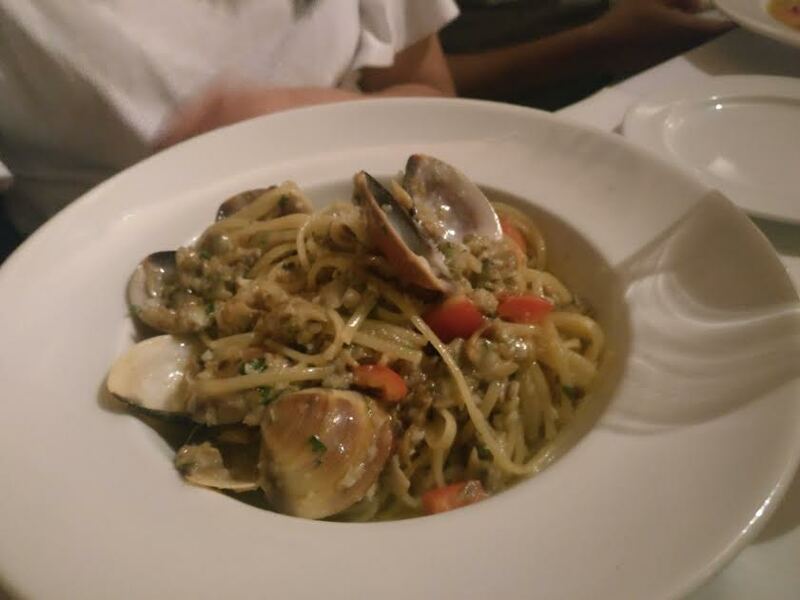 The pasta is delicious and made with quality, so $13.00 is an absolute steal! Service wise, it was a bit hard to waive our server down but he did come by a couple times to check in on us. Make sure to book a reservation because it gets very busy on Tuesdays. Originally, Coffee and I had plans to eat dinner in the West End. But on the day of, it was pouring rain, I didn’t get enough sleep the night before, and overall did not want to make the extra trek to downtown anymore. 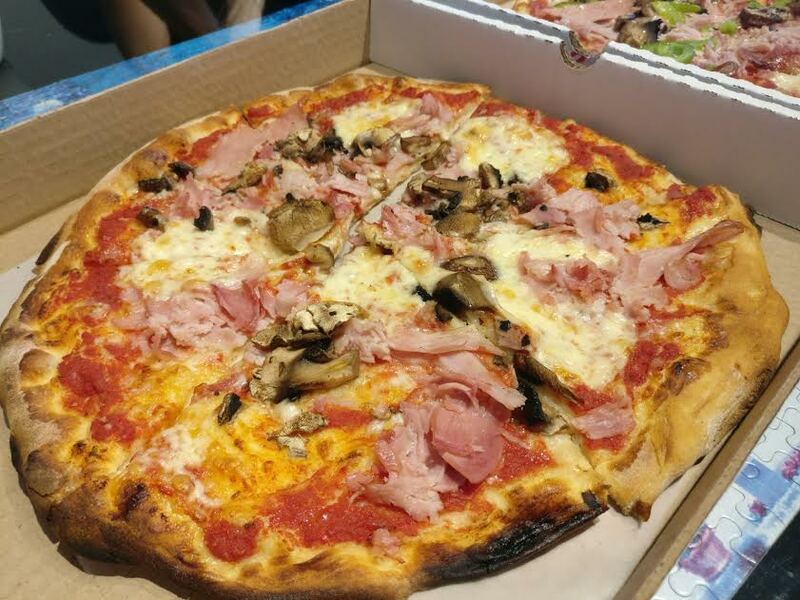 Luckily, she was accommodating about the last minute change and so I quickly looked up some places on Google and came across Assembli, a new DIY pizza place which had good reviews! 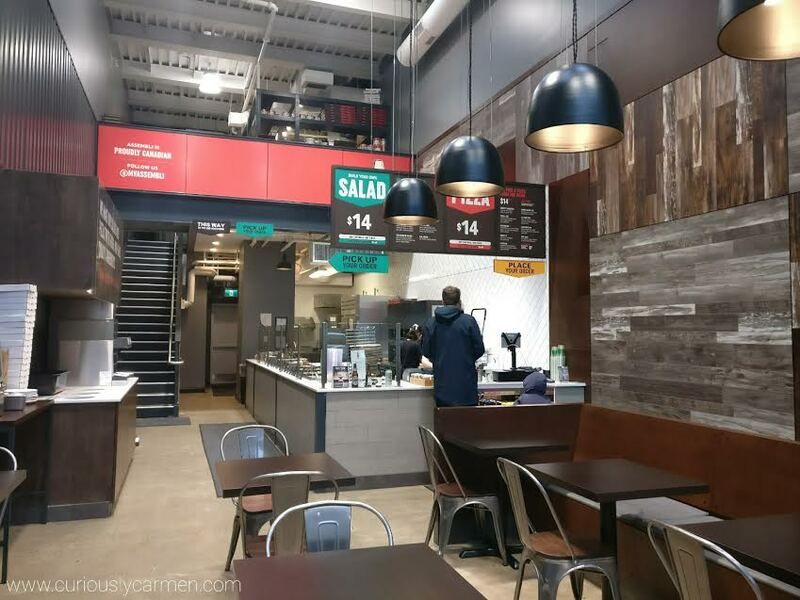 Assembli is located by Broadway and Cambie, an easy walk from the Canada Line. It seemed to be pretty new and it was comfortable in there, with super high ceilings and spacious seats. It seemed like a restaurant that would be really busy at lunch with office workers, but it was quiet when we came in the evening. The best part about this place is that for only for $14, you can get a decent sized pizza with unlimited toppings! Yes, you read that right… unlimited! Even the meat! I definitely took advantage of this deal. 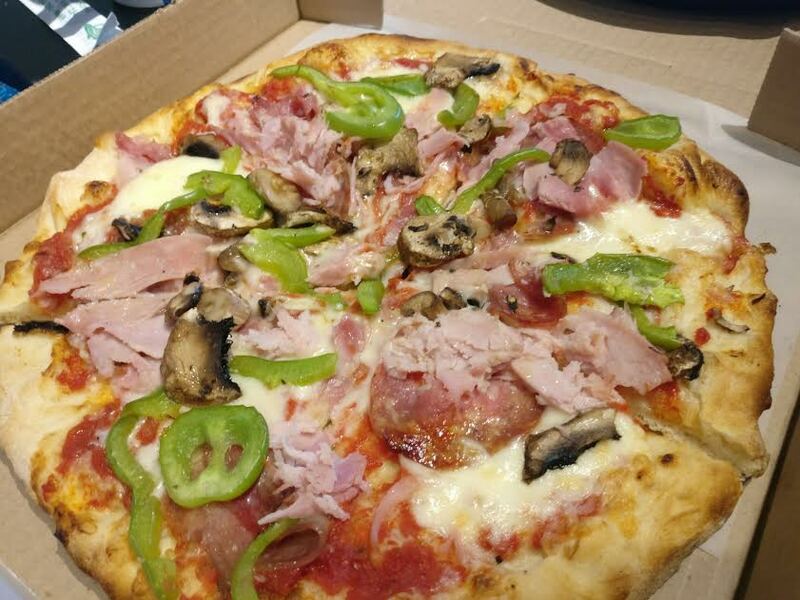 Custom pizza, $14: To create your own pizza, it is like Subway, where you tell the staff what kind of toppings you would like. 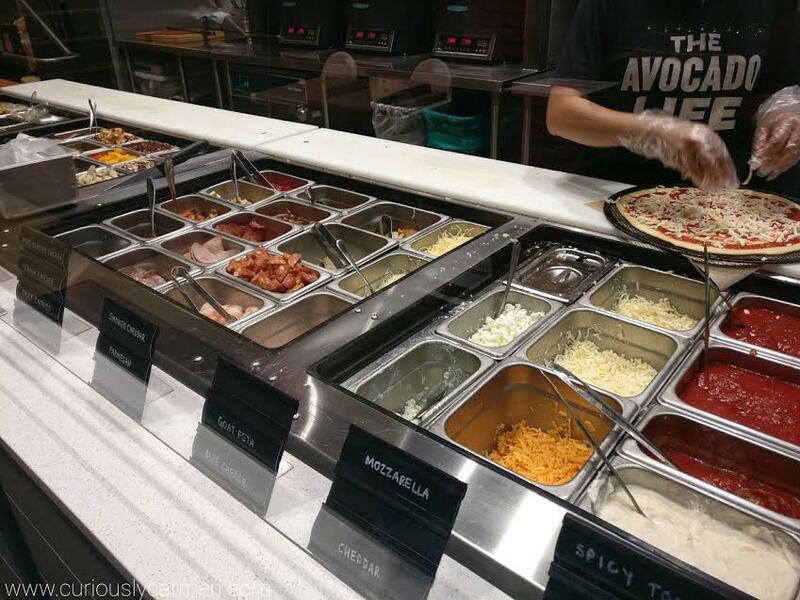 You pick your own: sauce, cheese, meats, and toppings. Afterwards, they bake it for you fresh and bring it to your table. I got the: spicy tomato sauce, cheddar cheese, mozzarella cheese, chicken breast, shrimp, salami, mushrooms, pineapples, and red pepper. 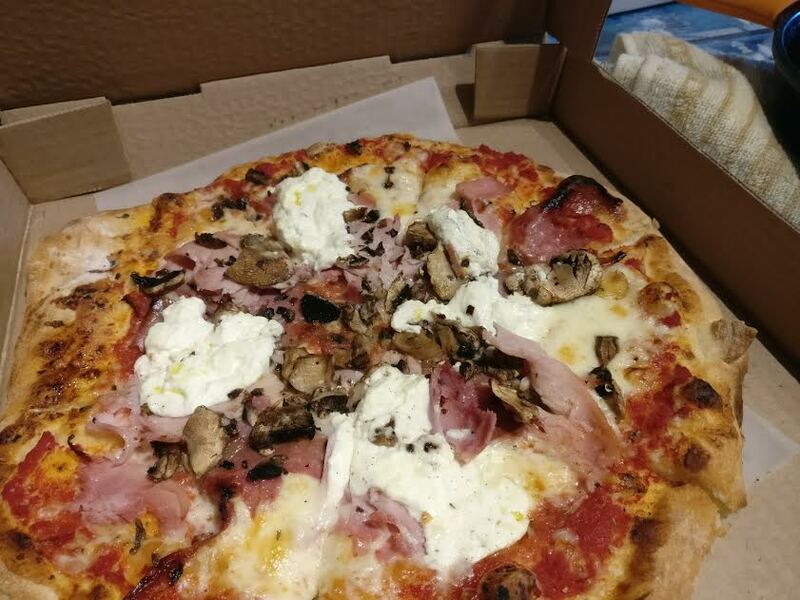 I absolutely loved my custom pizza and thought it was such a good deal for $14! It was really cheesy and they did not skimp out on the meat. Every bite had a different meat. 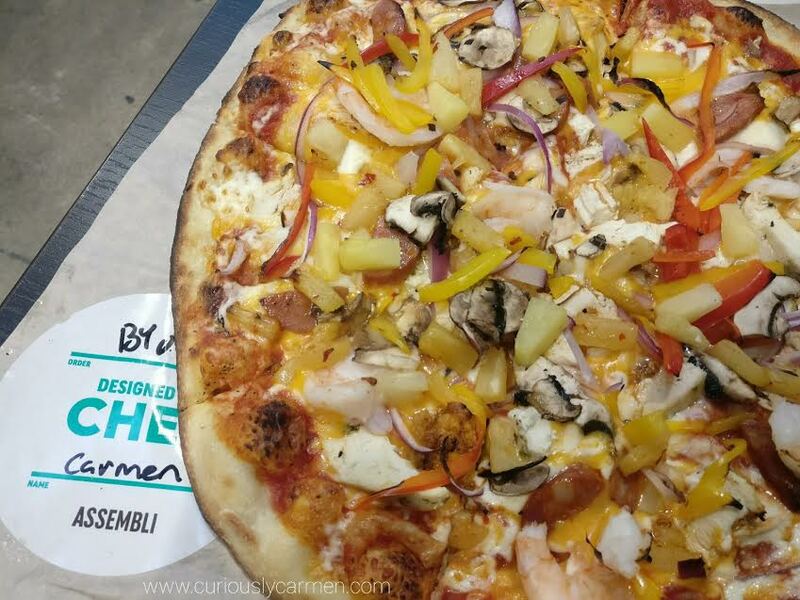 You really can’t go wrong with a custom pizza since you’re picking the ingredients that you like! All Greek To Me pizza, $14: Coffee went with one of the pre-determined pizzas. 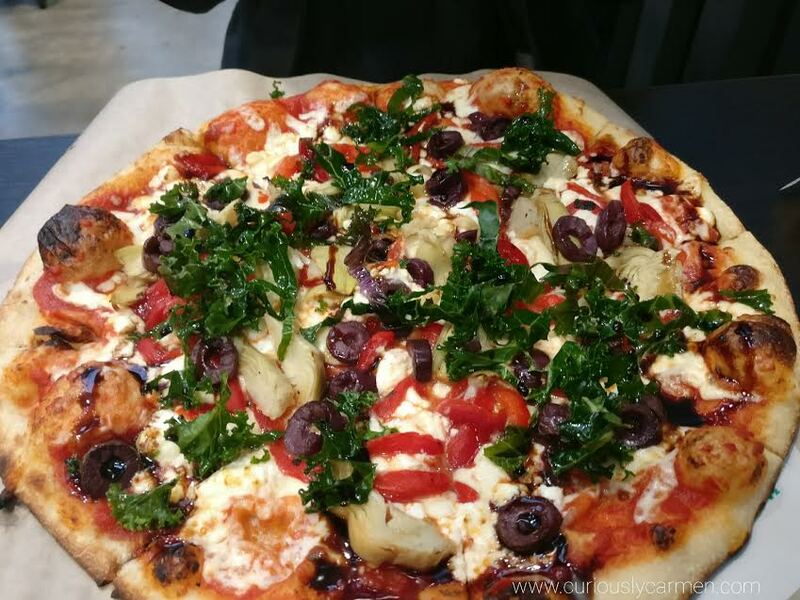 It came with goat feta, mozzarella, red peppers, olives, artichokes, kale, and balsamic drizzle. She was a bit disappointed with her pizza because the melted goat feta had an odd texture that made her pizza very wet. I had a slice and I agreed with her that the melted goat feta did not go well. If she came back, she would also order a custom pizza. Overall, I would definitely come to Assembli again and recommend checking it out. For $14, it is quite a good deal and they have a generous portion. It’s been awhile since I celebrated my birthday with a group of friends, so I decided to do that this time. I forgot how fun it was and should probably do it more often! Anyways, I was wanting to go to a nicer place but didn’t feel like heading downtown. 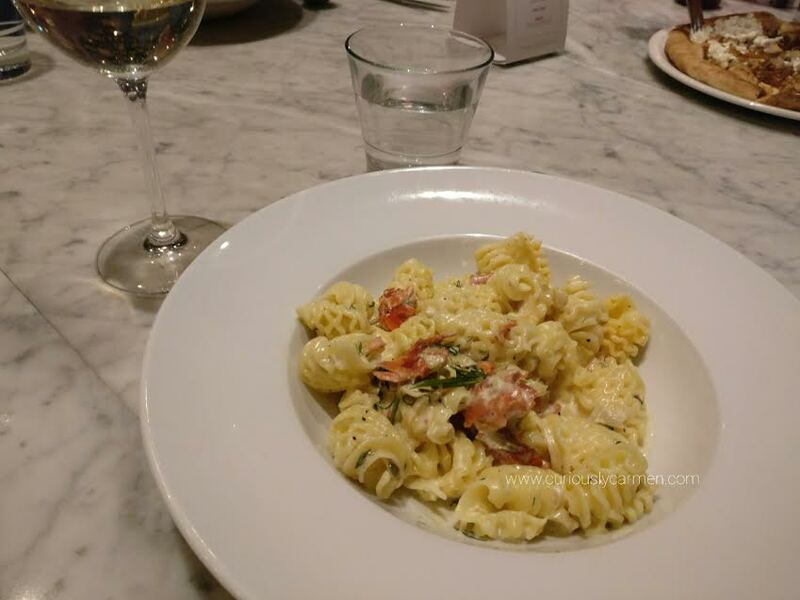 Trattoria was a good option since it is owned by Glowbal Group and is large enough for groups. The only thing I didn’t like was that they charged a cake cutting fee of $3/person ($3 x 15 = $45 extra) so we did my birthday cake somewhere else afterwards. We were given a semi-private room for the fifteen of us, which was pretty nice. It was separated by a glass wall and a floor to ceiling wine shelf. Throughout the night, we had our own designated server as well. Smoked Salmon Radiatori, $18.95: Originally, I had my mind set on their pizza… but after reading this on the menu, I changed my mind. It was absolutely delicious. If you love smoked salmon and dill, this is the dish for you. It was very creamy and came with a good amount of smoked salmon. The only negative thing was that four of us ordered the same dish, and the portion sizes were not consistent. For example, two dishes were noticeably smaller than one of them. Pictured above is the smaller portion, while the other dish was at least 25% bigger! 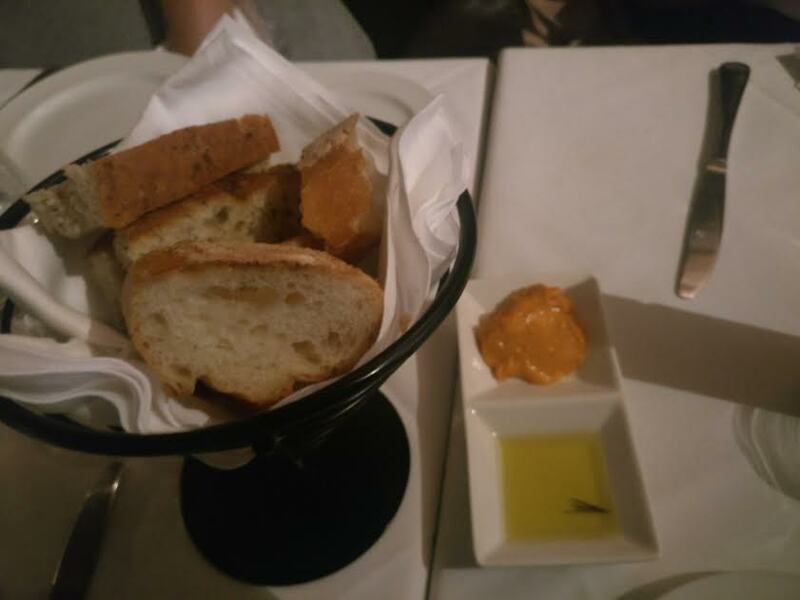 Cheesy bread, $5.95: This was ordered as a side dish, and omg it was amazing. It was a garlic bread with lots of melted cheese on top. You seriously can’t go wrong with melted cheese. 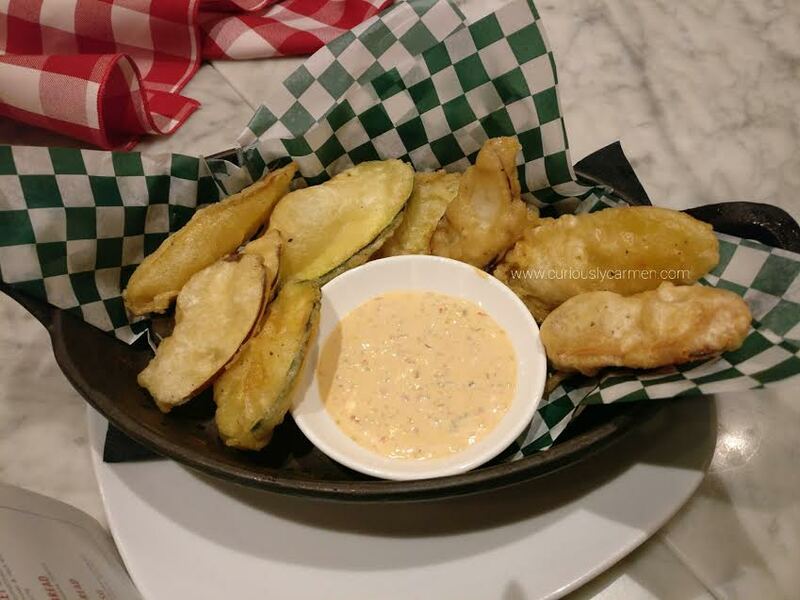 Fried vegetables, $10.95: My friend ordered this and immediately regretted it after a few bites. It was definitely not worth $10.95 for a few pieces of vegetables. As well, they did not have any seasoning so it was quite plain. 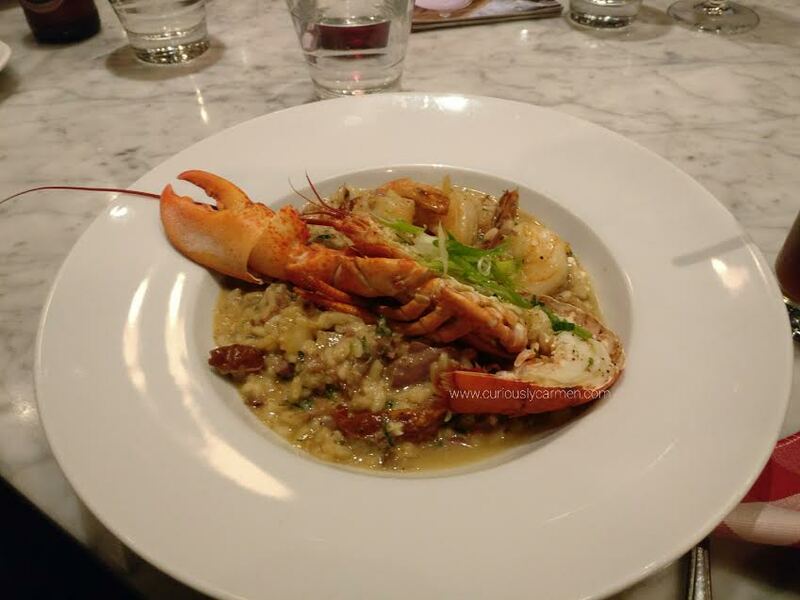 Risotto of the day, market price: The risotto of that night was lobster. It looked really good and my friend said it was delicious! Pasta platter, $23.95/person: Two of my friends split this, which was a really good idea. 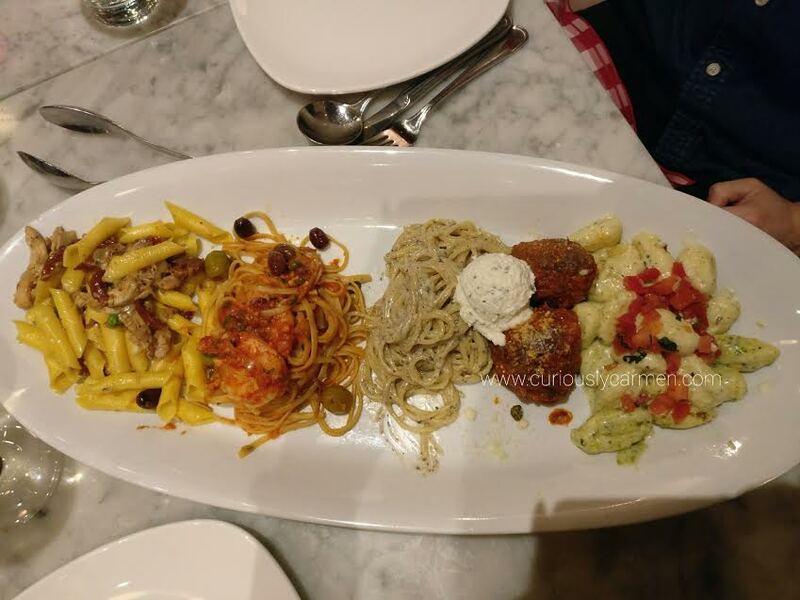 If you’re indecisive, you get to try four different types of their pastas! It comes with the truffled spaghetti & signature meatballs, gnocchi, garganelli pollo, and the linguine gamberi. 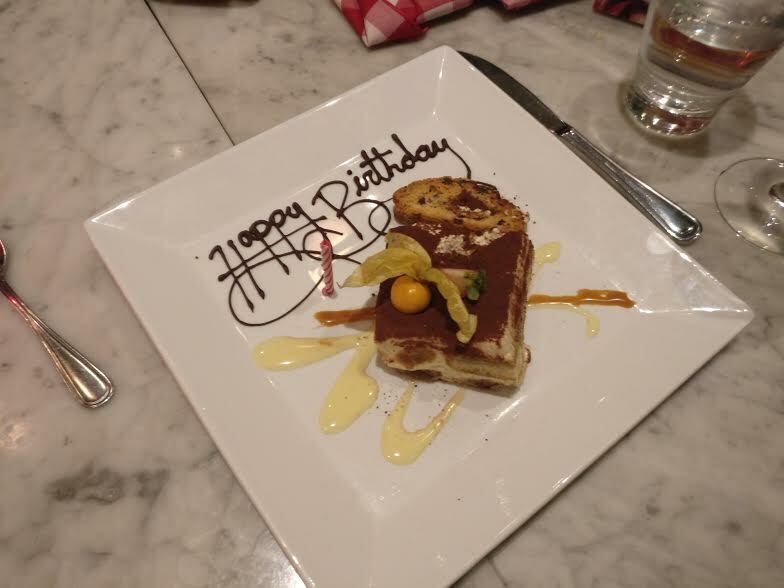 Cake: As a bonus, Trattoria gave me a complementary slice of tiramisu cake! 🙂 Thank you! Overall I had a great time at Trattoria, and the food was good. There were a few hiccups with forgotten drinks but service was consistent and friendly. They have pasta specials on Tuesday so I would love to come back and order the smoked salmon pasta for a cheaper price!